A very tiny love letter to two of my favorite game franchises. A little dude garbed in green wakes up to find himself on an otherworldly island after being on a ship that was picked up into the sky by a terrible magical storm and dropped there. After blacking out, our little dude awakes to an eerie silence and a deep feeling of unease. But what's that? Something seems to be calling him from a nearby cavern... a spirit? "It's dangerous out there. You'll need a blade by your side. And I'm not talking about some cheap wooden crap.. gah, I hate stingy old men and their magical shooting fire." 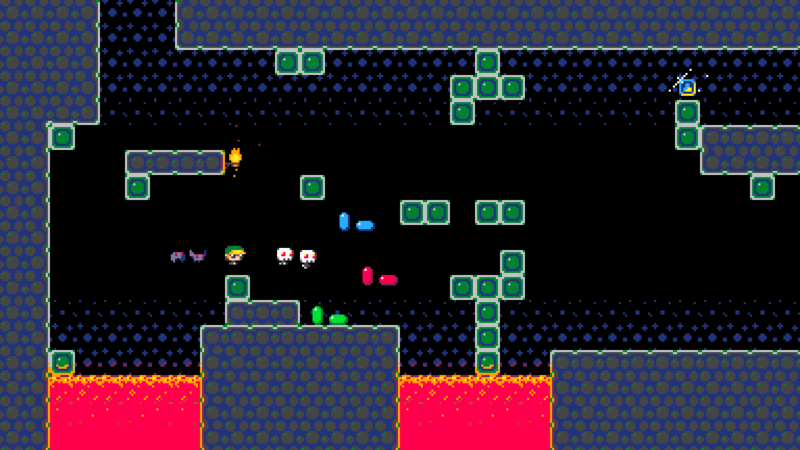 Okay guys, would you like to see a small Zelda fan game that uses my 12x12 tiles/sprites that are restricted to using the Pico-8 palette? It'd be graphics like the attached 'sort-of-a-mockup' screen. Link will probably just have a large sword called the 'Luminous Midnight' (sword title subject to change), which is a type of phantom/spirit sword, and he will not acquire any other items like a boomerang, bombs, bow, etc., but the only other possible items to include would be upgrade types - things that do not introduce new gameplay mechanics, and on that note, I'm not even sure I'd want upgrades either, so maybe just get the sword and not get anything else after that at all? The reason I'm not so set on those last things is because they're more "quest-like", and I have no idea how to make a sort of quest-styled gameplay without it becoming too large scale of a game. So yeah, I'm really not sure what I'm expecting to get by posting this, but I guess my thinking is that maybe someone will say something that will give me the direction I need to have inspiration to make this into something cool. Re: Shall I Zelda Fan Game?? Thanks, I looked up Salt & Sanctuary since I've never heard of it. I think I need to watch some gameplay to really get what you mean though, so I'll keep this in mind and look into it further later. UPDATE: I just started working on designing the starting point of the game (seen in the spoiler below). Obviously still quite incomplete. I'm trying to make a wooden pirate ship that's old and totally wrecked, and not under water or even near water for that matter, so no crustaceans or sea weed or anything like that on the ship. My initial graphics for the ship are too detailed compared to my already existing graphics, not fitting the target style, so I made a couple other tiles, attempting to figure out how I can do a simple wood look and I guess I was making it harder than it needed to be, cuz the one all the way to the left appears to work pretty good, even though it has no real texture to it. So yeah, I'll continue to fumble around a bit with the graphics until I get the main stuff knocked out. Gotta figure out how to do cannons that actually look like cannons, and masts, etc. I'll probably just get it 'good enough' and move on, and I'll just plan to fix it up later. I want to start working on the actual engine ASAP, since I don't really get a lot of time to work on this, and still got to decide on a few things before starting the engine. EDIT: Had some more time so I worked on the boat some more today (added second pic in the spoiler below). It's shaping up I guess. I'm drawing it as a complete ship first, then I'll make it look destroyed. I kind of have to do it this way because I'm an inexperienced artist and I had trouble visualizing. Gotta help myself as much as possible, haha. EXIT x2: BTW, after posting, I did notice some tiling errors but they're not worth updating the pics with fixed versions. So I'm just saying, yeah I see it, I see it. All I can say is that I definitely should've gotten more sleep. Alrighty, got the busted up boat done enough (see pic in spoiler below) to move on. 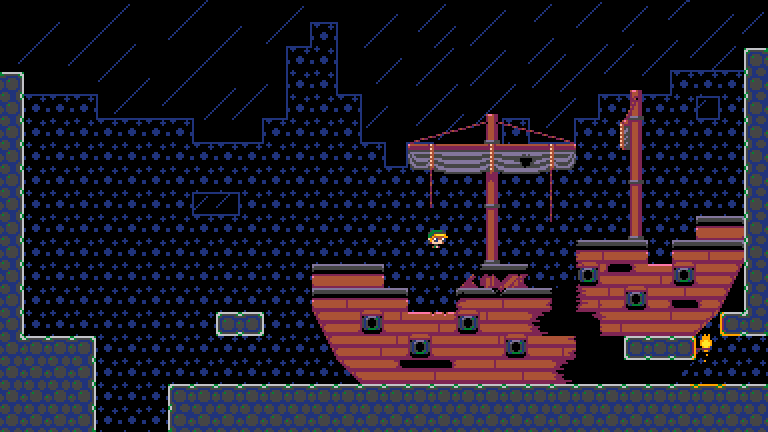 Though I'm really not at all happy with the masts, especially the ropes, and not sure how to fix this stuff, even if I try, but hey, video game graphics are my weakest area of game development so I guess I did okay, considering I don't really know what I'm doing. But this is actually why I'm making custom graphics, to push myself to improve. The reason why the boat is wrecked in this way (as shown in the pic in the spoiler below) is because it was carried and thrown during a torrential rain storm which was created by some bored and nasty demigods who live in the sea. The boat ended up getting thrown by insane winds and it fell into the giant pit... thingy... place? So yeah, Link is on an island in this game, and most of the game will take place underneath the surface of the island. But how did Link get on the island and what is even going on here?.. I do have some ideas for the backstory and all that, but no reason to spoil. Next up is a little more planning to figure out what I want to do for a prototype and to also to get a more complete general idea of the entire game - how it will play from start to finish. I'm likely going to go ahead and include some kind of abilities, because I want that Metroid thing going on with the skills that give both tactical advantages as well as ability to overcome certain obstacles. I'm open to any ideas from anyone about anything or just tell me what you think about the project. Not sure anyone has anything to say at this point though. Wow, it's been 3 years.... 3 Y E A R S... and this topic was still on the first page in the discussion sub-forum. The activity here truly is no joke. So anyway, I'm reviving this because I decided I needed to make something smaller scale before continuing on my far bigger game project, and this is one of the game projects that I always felt a little more passion for than all my other small scale ideas and doodles. I don't know if this game will belong in the "Zelda" or "Other" projects section just yet, as I'm still not sure if I'm truly making this a Zelda fan game or if I'm just going to make it open for the player to see him as Link or not. Secondly, it's still very early in development (spent 2-3 weeks of my free time on it so far), so it might not warrant a project topic just yet. I could give a demo, but it's literally just 3 playable screens where you can do nothing but jump around. I obviously ditched the Pico-8 palette. I also updated the main character a little to give him a tad bit more height and to be more readable. And of course, my previous mock-up is now actual in-game stuff ("I'm a real bo-.. er, game! "), etc. etc. 3 YEARS LATER, IS THIS THE SAME GAME? WHAT TO EXPECT? Still the same, but a more fleshed out concept; now I have a good idea of where I want to go with this. The plan is to make a very tiny love letter to Zelda and Metroid. The world is currently planned to be 7x7, so just 49 screens. The only item planned is a sword made of spirit/phantom energy, but there are some upgrades for it. For e.g., a "dash slash" which can be used on enemies, to bridge gaps, and to maneuver around better. I want all upgrades to be very usable, not just something to use on an obstacle and to set aside until you come across another obstacle again. So you'll pretty much get a sword, explore, fight stuff, get upgrades to reach new places, etc. - very typical Metroid-like, except with a sword. Other people have done this kind of game many times before, I know, but I haven't, and I really want to make my own. Plus, I think it'll end up unique enough to stand on its own as a tiny-yet-enjoyable experience. That's the hope, anyway. WHATCHA GOT DONE SO FAR? WHAT'S NEXT? I'm coding the game in GML, using GameMaker Studio 2. I programmed a movement engine which properly handles sub-pixel movements and also avoids staircasing movements via an alternating ratio-based x y movement loop. I've also got things like a jumping grace period, etc. - technical and UX stuff like that. Aside from those things, I've really only done a bit of graphics and animation work, implemented screen transitioning, and I've tweaked the various variables with physics to get it feeling mostly good, and I'll be tweaking that further soon™. The next step is to work on the player character's sword, starting with the basic attack. I haven't done anything in this area yet, so I'll have to draw the sword and the attacking animations, figure out a good sword reach, etc. I'll leave it at that for now. Any thoughts are certainly welcome. Hey! Good to see you around, and thanks for the comment. BTW, I'm expecting to be updating this thread with progress about once a week. Hoping I can keep up the momentum. It looks great so far. Let me know whenever you need help testing etc. It's the least I can do. Thanks for the praise and the offer to test. I bet I'll take you up on that later. I figure I should also mention that I've been making music for someone else's game off and on over the past few months and it's back to 'on' again, plus I picked up some more hours at work this week, so that's got me a bit behind on where I wanted to be with my game, but I might be able to catch up on progress tomorrow. Actually, the game that I'm making music for is what the developer referred to as a "ZelTroidVania" when he pitched it to me a few months back when asking me to do music for it, which seems fitting, though possibly slightly redundant, so I'll likely post about the game in the Entertainment section later, since it's a game other Zelda fans might enjoy. Of course, I'll wait until I get the okay to share more about the game, since I'm just the music guy. Well, I did work on the music looping and fade handling code, so I guess I'm a 'music guy+' or something, but whatever. I wasn't able to get much done because I took an extra shift at work + I worked on some music and a preview trailer for that Zeltroidvania game this week ( BTW, I got the go-ahead to make a topic here for that game, but the public demo isn't ready just yet, so later ). Animation is a facet of game dev that I desperately need to build more skill in, so this took me a few hours to do because I had to research and mess around with motion blur and other things. It still might need more work as well. I dunno. As I said, animation is something I really need to work on, so I probably don't even know of various issues with it that a more experienced animator could point out. Of course, it's lacking some glow and particle effects I have planned and designed, but I'll save all that for a new post, when it's not just words. Updates! I changed the thread subject/title because I've decided to make this an original game, not a Zelda fan game, but even so, it's likely to have a good amount of content that's intended to show blatant inspiration from Zelda, and with the way the game is planned to play out, the main character's identity is really never explained because it all works out better that way, so - as I said before - you could assume he's Link and I'd just say, "Sure! Why not?". If anyone is wondering what "MiZM" stands for, it's "Mini Zelda Metroid" (I literally almost forgot that's what it stood for though.. lol, oof). It's just the working title; I'll change it once I know what to call the game. I've got the sword art and code to the point where I have a working attack that feels and looks 'good enough' for now. I plan to touch it up and expand on it later. Oh man though, I've programmed platformer shooter mechanics before, but this is the first time I did platformer melee mechanics, and I've found that it's SO MUCH MORE... just MORE. So it took me a lot of playtesting to get things feeling and working well enough. It was a bit of a grind, so I'm happy to move on. I plan to make it an acquirable item, as opposed to something you can do from the beginning. The item will probably be some kind of gloves with grip. It's funny, because I wasn't planning on having a ledge grab mechanic at all, and I only ended up adding it because there was a point where I was feeling drained and disheartened from the grind on that sword (i.e. failing at making the animation look okay enough, continually realizing there's another thing to add or change, etc. ), so I wanted to work on something else and come back to it, to give myself a sort of a break, yet not a break. I didn't think it'd be all that important or usable of an ability at that time, but later I realized there are some good action-puzzle challenges I can make with it, and I have some ideas for making it useful to deal with some enemies. It also extends the player's reach. For e.g. in the video, I climb on top of the mast, but you can't get up there without the ledge grab ability. Removed previously attached pics because it cluttered the thread. I put them in spoilers at the end of each corresponding post. 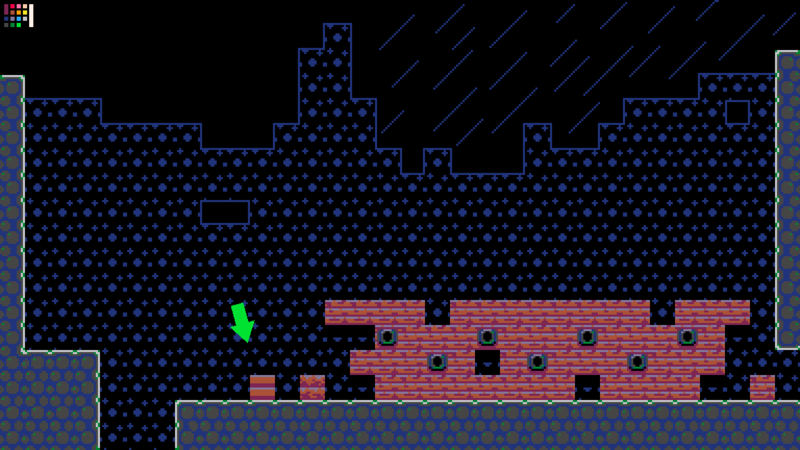 All the rain is held in a 2d array and is run by a single instance. I probably could've done better with a shader, but due to the interactivity with tiles and some objects, it seemed overkill and over-complicated to do so, and T B H, shaders are still a limited area for me. The array method has proven to be quite CPU-efficient, so I'm good with it. I also made Spirit Blocks chain react when destroyed and I squashed a few bugs. Next up to add is an aerial dash attack which will be performed by pressing jump and a direction in the air. I want to focus mostly on adding in all the abilities you can get throughout the game, then I will design the world based on those abilities, so the scenery might not change much for a bit and things might feel like they're progressing slower than they really are. I just realized, I might want to give updates on my game less frequently, to help match the low activity on here. I'll probably just edit this post again when I give another update. Well, the dash ability and stuff turned out to be worth a new post, imo, so here we go! The movement is 4.2x more fun with the dashing ability and it feels pretty fluid, so I'm happy with it. The dash can be leveled up to allow three dashes before landing. In the video I had it maxed, though I think I only ever used two dashes consecutively. It's possible two dashes will be the max in the end, if I feel three is too OP. I almost went with dashing being restricted to left and right only, because at first I had 4-directional dashing, but no matter what I did with the x momentum, it felt weird when dashing up or down, so I cut out the up and down dashing, but then it just felt limiting, and not a good kind of limiting - like a frustrating "I can't control this how I want to" kind of limit. So I fired up Celeste - the queen of dashing mechanics - and realized 'oh yeah' that game has 8-directional dashes, so I figured I should put in the extra effort and try 8 directions, and I'm very glad I did. It probably doesn't look all that special in the video, but it feels great, and I'll improve the animation aspect more later, so it'll look better too. I've been focusing on programming all of the abilities so that's why I haven't done more work on the map and thus the scenery has remained the same across these updates. I want to lay down all the abilities first, so I can playtest them a bit to know if I really want them or not, then - when I have all the abilities set - I can design the map based on those. It just makes sense to do it this way, since I'm shooting for a Metroid-like progression. As far as the next ability goes: I'm currently trying to decide on something about the sword, because I have another sword concept that I really liked, being the 'shock' type. I like the idea of shocking things to stun them, using electricity to power stuff, etc., but then that leaves me thinking about how many types should the sword have, if any, and what would the current sword be. 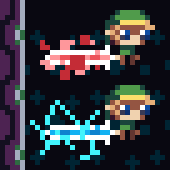 I'm playing with an idea, calling the current sword type the Rose Blood, perhaps making it siphon HP, but I can't help but think that maybe I just need to change the normal sword color and particles and just make it a basic starting sword. I just really like how it looks, so I wanted to keep it. All that said, it's possible I'm going too far and I just need to prevent myself from giving in to the feature creep. I am still planning on making this a pretty small scale game. So I'll be thinking on it. This looks great so far man! Looking forward to playing this! Thanks! Hopefully the game shapes up to be something you'll like. Please ignore the weird tile stuff going on. It's a test room and it's currently like that because of my strange way of testing out my tiles and experimenting. Not really a part of the game, but it's going to make things far nicer for me, moving forward. Chargeable attack for greater range and damage. Leveled up charge attack which shoots a ball of magical destruction. Of course, it's got some force behind it, so who's to say it couldn't also be used to flip an otherwise out of range switch or something? Blue and red rings which cut the damage taken. An 'as obvious as I can make it' reference to the original Zelda. As far as the shock sword attribute goes, I've decided it'll be a leveled up version of the original sword. That's actually one of the reasons why I changed the sword color to purple instead of red, because the cyan lightning type stuff should look better over purple. Also, the blade is a kind of spirit/soul energy, so purple seems more fitting. Lastly, I'm experimenting with some 80's 'retro wave' (no better word for it comes to mind) elements. I don't want to make it cyberpunk though. I have a certain vision that's a bit hard to explain because it's largely influenced by experiences years ago at arcade rooms and a roller rink, having to do with colors, dim lighting which increases the contrast between the room and the arcade machines, contributing a special atmosphere, and Sweet Tarts and stuff. So that all probably sounds a bit weird, but my hope is that those influences will make for a nice otherworldly design and atmosphere. I am trying for something alien, much like Metroid, but also magical, so that's kind of why I'm thinking this should work, if I can pull it off. Page created in 0.093 seconds with 52 queries.